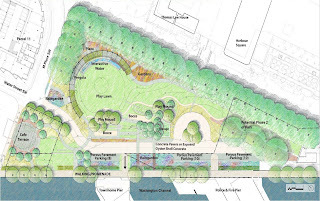 A third meeting of the Waterfront Park charrette occurred last week, where the landscape architects presented their updated plans for the park (above is a rendering of a fountain and semicircular pergola). The park will be located at the southern end of The Wharf development, which is now dominated by a parking lot for the cruise ship operators. If you recall, there were two other charrette sessions late last year where a select group of community members (me included) were invited to help plan the 4.2-acre site. As a result of the prior sessions, the landscape architects from Nelson Byrd Woltz Landscape Architects and Lee and Associates Inc. presented their plan for the park, as seen below. The park as planned will be built in two phases. There is a section of the park footprint that is now owned by the National Park Service near the Titanic Memorial that will be built in a second phase once an agreement is made with the federal agency. The biggest change to the park from the earlier version is the reduction in size of the pavilion to about 800 square feet. It will no longer offer food service and will serve mainly as storage for equipment used in the park, such as bocce balls and other items. The storage pavilion will have a green roof and perhaps a green trellis on the side. Otherwise, the other elements of the park have remained the same. The existing willow oaks will be maintained and will frame the northern and eastern edges of the park. A semicircular pergola on the northern end will offer some shade (with integrated solar panels in some areas to help power the lights planned in the park) while a seat wall (potentially made of natural materials like stone) and a shallow fountain will follow the shape of the pergola. The play lawn and pergola will be elevated to allow views out toward the Washington Channel and the Potomac River. 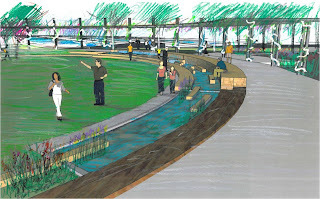 Play mounds will be positioned to help screen the townhouses planned at Pier 4 and the Harbor Patrol. A garden area will be located near the willow oaks and rain gardens will be placed throughout the park to help capture runoff before it gets in the channel. Ramps and stairs will lead down from the play lawn to the roadway where access must be maintained for Pier 4 and the Harbor Patrol; however, the road won't be visible from above. 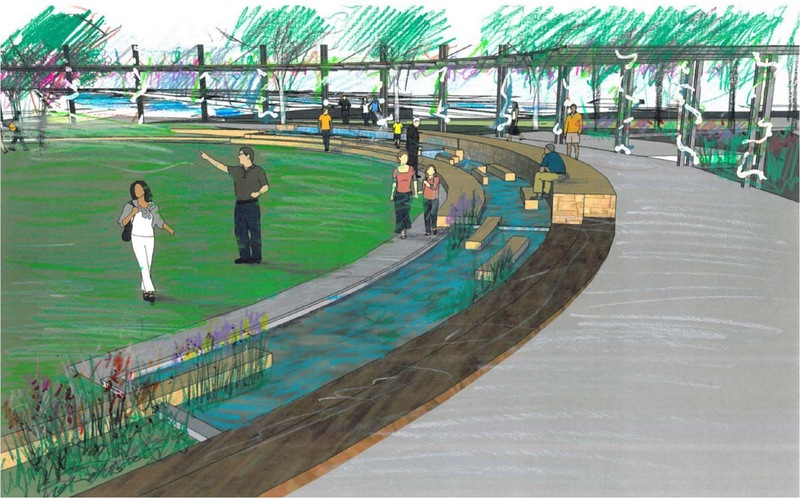 Parking spaces for the Harbor Patrol and Pier 4 will be built using porous pavement and pathways throughout the park will be made with either concrete pavers or exposed oyster shell concrete. The cafe terrace shown on the rendering is where the Maine Lobsterman statue is currently located and is not officially part of the park, but is close enough for patrons to grab a refreshment or bite to eat to take to the park in lieu of a pavilion inside the park. Security will be provided by Hoffman Madison Waterfront, so the risk of homeless people sleeping in the park will be minimized. The charrette group will reconvene once the park design is closer to being finalized. There are still elements of the park that still need to be decided, such as lighting, seating, and a name. What name would you give the park? Renderings courtesy of Nelson Byrd Woltz Landscape Architects and Lee and Associates, Inc.
As far as homeless sleeping in the park, if this will end up as a DPR property, a 10pm closing time can be enforced and no one can sleep overnight in the park, homeless or not. If it ends up NPS no one may sleep overnight without a camping permit (unless we see an Occupy Waterfront or similar group). If it will be private property, the owner can simply not allow it. Points to consider if we want to head off the homeless issue before it starts. Nice post. Has anyone seen the Yards. I am hoping for something as nice if not better! Can't freaking wait!!!! What's the timeline on this? Isn't this part of the last phase of the development? 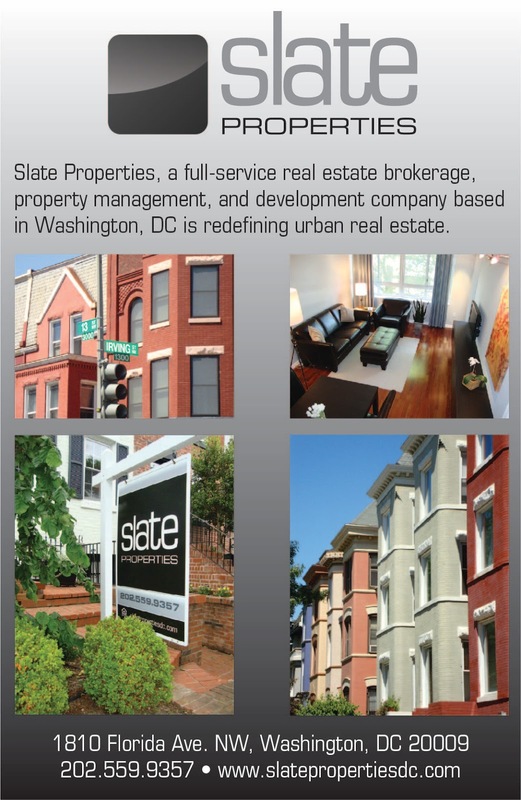 SWag: The use of this park will differ from Yards Park since that park is seen more as a citywide attraction that hosts several festivals, whereas our park will be more of a neighborhood park. Design-wise, it should be just as nice. Jennifer: The park will be built during the first phase of The Wharf since the ANC requested it be done earlier in the development as one of their conditions of approval of the stage one PUD. Cannot wait until the park completes construction and the parking lots and disheveled side walks are replaced. What is taking Z-Burger so long? And when is BoA and that eyesore of a concrete pad finally going away? From previous entries, I swear another bank will be coming into the area. Extending the path in front of the Z-Burger towards Arena Stage (basically past the building to be renovated) would give theater goers a more understandable route. Wish there was a dive/cheap bar somewhere down here. This would attract a younger crowd that currently sees Station 4 as just too expensive. Really hope the Circulator reconsiders its route when the first buildings on the waterfront are done. An actual circular route would be great to connect SW/SE/National Mall/Capitol Hill/Union Station/Maybe even China town. SWag: Let's hope so! The nearest hotel to the park will be at 7th Street. 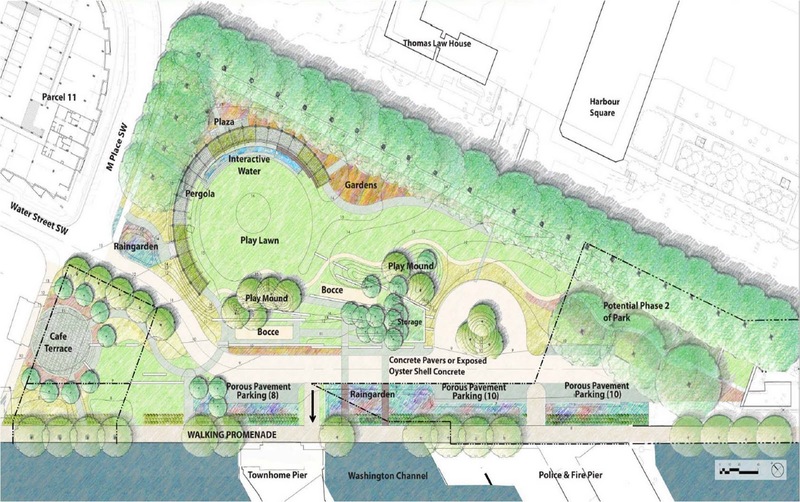 M Street Landing, which is the next public space closest to the waterfront park, will be more active with fountains (and an ice skating rink in winter). Gangsta: Help Wanted signs are now up in front of the restaurant. At this past Monday's ANC meeting, it was announced that Z-Burger would open in 2 weeks (my guess though is it will take longer because they need to hire people, then train them). Based on that, my guess would be late January/early Feb for the grand opening. BoA's lease ends 12/12, but JDLand reported last month that they are in negotiations with a landlord in Near SE to move there this spring. If that happens, then the trailer can be removed sooner. Commissioner Craycraft reports on his Facebook page that TD Bank is out at Waterfront Station and the developer is looking for another bank (maybe M&T Bank), but I haven't gotten confirmation from anyone about this, so I haven't written a post about it yet. SWill: Why is BOA not moving into one of those empty spots in the government buildings? SWag: They couldn't come to terms with the landlord. Maybe the rent is too high for them? Gangsta: My understanding is that the Circulator will likely return October 2013 but with a new route that will go west (left) on Penna Ave NW and work its way to a northern terminus near DuPont Circle. A lot can happen between now and then, but the idea is to connect the Waterfront/L'Enfant Metro area with the Golden Triangle/DuPont area in a way that MetroRail doesn't do smoothly. One thing that hurt our SW Circulator's ridership was the duplication with the Yellow and Green Line runnings under the majority of it's route. 2. Several of the Water Street bars are cheaper, and Cantina Marina is pretty divey. It's a madhouse on summer weekends, but quite chill otherwise; they reopen in March. 3. Last year's DDOT "DC Circulator Transit Development Plan" might be where Commissioner Craycraft saw a path for a new circulator. It describes 11 new corridors where Circulator buses might be appropriate, including a route from Dupont Circle to Navy Yard via Connecticut, 17th, Independence, Maine, and M. That route is planned to be established by 2015, along with a pair of Mall routes. The 7th St Circulator route could also be reinstated once the Mall routes launch.